Not to be confused with World 6-3. Area 6-3 is the third course of Cosmic Adventure and the forty-eighth course overall in Mario vs. Donkey Kong: Mini-Land Mayhem!. 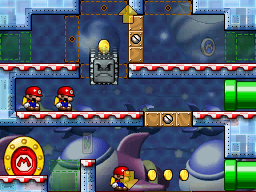 Two Mini Marios begin near the middle left on a platform near the middle level while the other begins on the bottom center on the platform on the lower level, with the exit door on the bottom left. In order to reach it, they must simply be guided via a series of Blockers and Green Pipes while watching out for the Thwomps. The M-Token is located at the top right, atop a platform on the upper level. To collect it, the top two Mini Marios must simply follow the first Blocker from their starting position and follow a Green Pipe entrance to it. The Mini Mario Card is located on the bottom center, atop a Magnet Rod platform on the lower level. The lower Mini Mario must follow the first Blocker from its starting position, then follow a Green Pipe entrance to it. In Plus Mode, the Mini Toad must be guided to the exit door first, followed by the Mini Peach and then the Mini Pauline. This page was last edited on September 18, 2018, at 06:22.